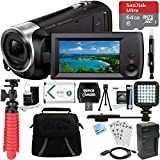 The world of midrange HD camcorders can be hard to navigate. Tried-and-true classics like the Sony HDR-CX160 can make it easier. I can remember a few times when I upgraded my gear and ended up wishing I’d gone for something with a bigger backing. Far too many times, I got something that either didn’t deliver as promised, or excelled in some way but did away with functions we all take for granted. 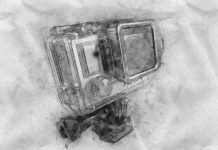 With something as important as an HD camcorder, it’s wise to look at what many users have tried and recommended. This Sony Handycam is an entry-level HD camcorder. It’s small and comes at an affordable price. Compared to its older iterations, the Sony HDR-CX160 offers higher quality footage, better zoom, and a bigger display. The hardware is better in general, and the performance has improved a bit. Pretty good stats overall. For an entry-level camcorder of this era, Sony HDR-CX160 holds up well. Entry-level camcorders tend to have a somewhat awkward, clunky design and mediocre handling. This isn’t the case with Sony HDR-CX160. It’s sleek, well-equipped, and durable. The touchscreen is larger than before, which means it’s easier to use too. It’s clear and responsive. Thanks to the fast processor, it doesn’t lag as many affordable camcorders do. There aren’t a lot of controls, and the camcorder seems more geared toward auto mode users. One slight caveat here is that the auto mode button isn’t that conspicuous. These auto features are effective and reliable. They’re quite impressive for this type of camcorder; the auto exposure function in particular. It’s fast to respond when you go from light to darkness and back. On the other hand, the autofocus isn’t the best that Sony has produced. This could be a trade-off for the long optical zoom lens. Unfortunately, it’s when you zoom in a lot that the autofocus begins to struggle. Other than that, it should be dependable. You get a few different recording modes. First of all, you can toggle the 1080/60p (true HD) quality. There’s a low lux mode for shooting in the dark. 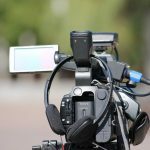 There are also options for slow motion and time-lapse footage. Then there’s an oddly specific mode called Golf shot, which helps you analyze your golf swing. You can also take photos, and you can set it to detect smiles and snap automatic happy portraits. But it’s worth noting that these are 3-megapixel photos, which is lower quality than what modern cellphones can accomplish. The Sony HDR-CX160 is so-so at audio recording, but it comes with a 3.5mm microphone jack for those times you need good sound. It lends itself well to long recording sessions, thanks to its long battery life, 16GB internal memory, and SD card slot. As for the video quality, it’s about average for this category. The Sony HDR-CX160 captures a decent amount of detail in 1080p mode, the sharpness is good, and the motion smoothness is great. It’s not the clearest video, but it’s good for this price range. The optical stabilizer does a good job, and the zoom is impressive. But a deep zoom makes for a somewhat shaky result without a tripod. Users like the smooth video and great battery life. Their main complaint is that the resolution could be better. They give 3.6 stars to the Sony HDR-CX160. 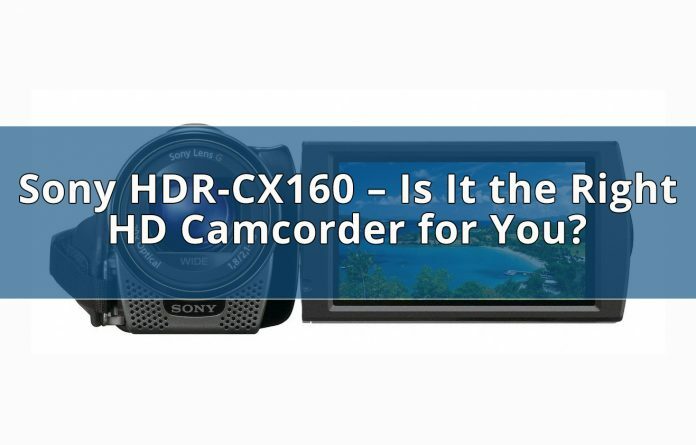 Being a discontinued mid-range camcorder, the Sony HDR-CX160 has a wide price range, and not many vendors carry it. New ones cost between $300 and $600 depending on details. Good used ones start as low as $160. Check it out here. With an abundance of entry-level camcorders on the market, you can only judge them next to each other. To get a better idea of how the Sony HDR-CX160 performs, let’s compare it to key competitors. We’ve chosen the Canon Vixia HF R800, Samsung HMX-F90, and the newer Sony HDR-CX160. These reviews are the result of extensive research and comparison of user experiences from across the web. The primary source is user comments from Amazon. 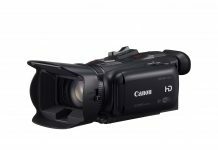 This is Canon’s low-cost HD camcorder with dual flash memory. It captures full HD 1080p video and offers special filters for a more pleasing look. It has a higher overall build quality and performance than the HDR-CX160. Its video quality is also a bit higher. The strongest feature of this camcorder might be the powerful zoom. To start things off, you get 32x optical zoom. You can take it further with the Advanced zoom, which brings it up to 57x. This feature uses an enhanced digital zoom program together with the optical zoom to get even closer without any significant loss of quality. The pure digital zoom goes up to 1,500x, which is extreme and will produce a very pixelated video. Thanks to the SuperRange optical stabilizer, things don’t get very shaky when you zoom in. I’d still use a tripod, however. You can choose between 24p, 30p, and 60p HD recording modes. With 35mb/s video and MP4 format, the quality is excellent and doesn’t produce a lot of compression errors. You get slow and fast motion modes and a highlight priority mode for an HDR-esque video style with better details in bright spots. There’s almost no noise distortion in common lighting conditions. On its highest performance setting, you can get about two hours of footage onto a 32GB SD card. It has a touchscreen for viewing and accessing the settings and features. When you open or close the display, the camera shuts on and off. Another cool workflow-improving feature is the Pre-REC function. This thing records by automation and saves the three seconds before you press the record button, so you don’t miss out on the action. You can also take photos at a two-megapixel resolution. In the connection department, you get an HDMI out and a 3.5mm jack for mics and headphones. And there’s a USB port for charging. Buyers like the comfortable handling and good video clarity. Their main complaints are the lack of internal memory and true wide-angle footage. It has a low list price of $219. You can find both new and used ones at many different prices. We recommend getting one here. This entry-level camcorder by Samsung has somewhat different priorities. It doesn’t provide full HD video like the Sony HDR-CX160, but it excels in other aspects of performance and ease of use. It makes a better option for some hobbyists with different preferences. The specs are lesser than those of Sony HDR-CX160 in general. However, it has certain advantages, especially for beginners. You get the choice of 720/30p and 480/60p video. It can also take 1.9-megapixel photos. For a camcorder of this caliber, it does an excellent job in the dark. Video quality won’t suffer too much when the light fades. The LCD is clear enough for you to see what you’re doing, and its viewing angles are great. The Schneider lens is the most impressive feature. It offers 52x optical zoom, which is a lot. That's almost twice as much as the Sony HDR-CX160. Getting this close with the clarity of optical zoom can make up for the lack of 1080p resolution if you do a lot of zooming. When the plain auto mode isn’t enough, you have other presets at your command. You get special modes called Portrait, Spotlight, Sports, Food, Beach & Snow, and Waterfall. With the Smart Auto mode engaged, it automatically switches between Night, Indoor, Macro, White, Landscape, Portrait, and Night Portrait. 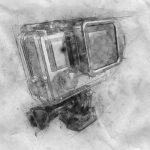 You don’t need to be too concerned with how things will look, the camcorder handles that for you. The time lapse feature lets you record for hours and get a fast video of a few minutes. 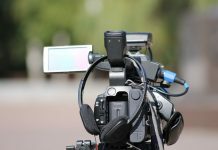 If you’ve ever been frustrated at the way digital camcorders make a new file every time you stop and start recording, you’ll love the Record pause function. You can pause the recording and resume later on the same video file. And you get a one-touch sharing button for uploading to YouTube in no time. You can also add music to your videos, and the built-in software will adjust the volume to let your recorded audio through. Users love the zoom and intuitive controls but aren’t crazy about the resolution and battery life. The classic Samsung F90 has been discontinued by the manufacturer. However, it does pop up used or refurbished. Prices range from $300 to $400. You can check it out here. This is an upgraded version, building on the concept of the Sony HDR-CX160 but taking it further. The more modern design bumps up the video clarity a bit and allows for dual recording. The main thing that’s changed is the resolution. It’s increased by about 40 percent. The HDR-CX405 features a wide-angle Carl Zeiss zoom lens. You can zoom to 30x with the optical zoom alone, and the digital zoom takes you to 350x, so you can keep your distance. The SteadyShot intelligent stabilizer keeps things smooth. With the EXMOR R CMOS sensor, you get excellent light uptake in low light conditions. Footage registers through an XAVC S codec, up to 50Mb/s. The result is clear 1080p footage at 60p. One convenient feature is the dual recording function. Using this, you can capture HD video and MP4 at the same time. So you can have a compressed preview ready for uploading to social media, for example. This way, you won’t have to record twice, or sacrifice quality, or convert files before sharing. Then there’s the Intelligent Auto program. It analyzes the shot and chooses between the 10 different scene presets, which it can combine in 60 different ways. So you can expect a consistent, good result in a variety of shifting situations. The presets include settings for low lighting, tripod use, twilight shots, and recording babies. You can also take photos with this camcorder, which come out at around nine megapixels. It’s easy to see what you’re doing on the 2.7” LCD screen. It’s bright and clear with a 23K dot resolution. This is also how you access the settings. There’s a USB cable built into the hand strap, which you use to charge the camcorder and transfer files to computers. You can also extend its storage capacity with an SD card or memory stick micro. Then, there’s the HDMI cable for viewing your footage on a TV or computer screen. Users like the lightweight and the stable video, but not the cheap overall feel. They give it 4.5 out of 5 stars. You can find this camera for between $170 and $270. Check it out here. Are you confused by all that technical data? We can fix that with a summary of the best and worst aspects of the Sony HDR-CX160. The primary advantage of the Sony HDR-CX160 is the built-in memory. You can record more, and you don’t always have to keep track of SD cards or tapes. It’s a very convenient camcorder in general. The Sony Hdr-Cx160 has a so-so resolution for something that has HD printed on it. The Canon and the newer Sony both offer better video quality. But this one’s still detailed and a good choice if you need a basic HD camcorder. The Sony HDR-CX160 does well in most regards. The video is high-definition with smooth movement. It can zoom in far without quality loss. The display is big and clear and easy to use. Its internal memory really comes in handy when you’re shooting. The Sony HDR-CX160 is lightweight and easy to use in general. It does have its drawbacks though. The video quality isn’t professional, that’s the main thing. But you can’t expect too much of an entry-level HD camcorder. Therefore, the Sony HDR-CX160 gets 3.6 stars. The Sony Hdr-Cx160 has a generous internal memory and features various useful scene modes for users to use. However, it has a complicated file management feature.